Will E-books Replace Traditional Paperbacks? The battle between the traditional paperbacks and the digital books goes on, mainly because of our endless love for them both. Now this often makes us wonder, or it at least makes me wonder, is there going to come a day where traditional paperbacks will finally become extinct? Or will it be the opposite, where e-books eventually fail. Purchasing a good book to read is a painstaking process. With the rise of Indie authors it has become difficult to know for sure whether a book is good or not. But what gave rise to all these confusions in the first place? The best and sometimes the worst aspect of a man’s nature, is his urge to improve his condition through replacements and upgrades. It can be traced back to the Early Man. When he was tired of walking everywhere, he decided to domesticate horses to ride, which in turn got replaced by automobiles, which is now man’s primary mode of transport. Man has always expanded his horizons to greater heights, in the field of technology, especially with computers, his leaps and bounds are a wondrous feat. Computers that occupied the entire room became desktops, which then became laptops, and have now become tablets and smart-phones. 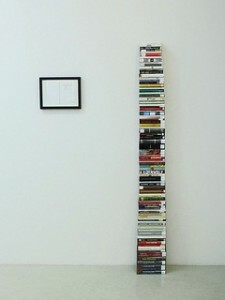 The next thing up for such physical compression, seems to be the written word in the form of novels and books. The e-book is the digital version of a traditional paperback, in a digital page-by-page format, readable on any compatible device. This has taken the tech market by storm. 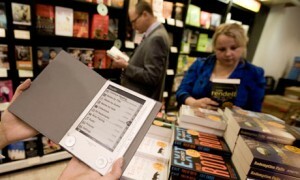 Amazon and Barnes and Noble, two major publishers are fighting it out with their respective e-book readers. So ultimately will e-books replace paper books and relegate them to the literal bookshelves of history? The cost of buying a device on which you can read your e-book is obviously going to be expensive. The Nook and Kindle alone cost around $150 each. 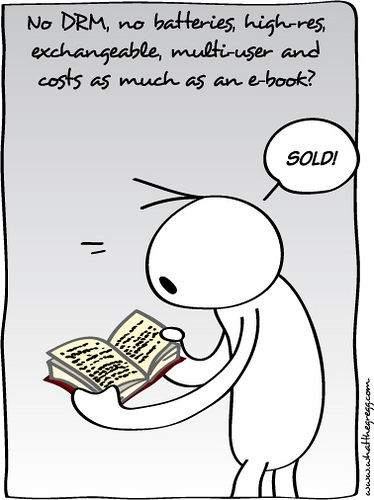 Now add to this the cost of your e-reader (software) the price which might be around another $100 and you’ve got yourself a very expensive book! On the other hand traditional paperbacks will cost you around $10-$50. No doubt once you’ve got the gadget the e-book will cost you nothing more than $30, and this in the end accounts for a far more number of e-books that you can read with the same amount that you would otherwise spend on paperbacks that are far lesser in number. But then not everyone can afford to buy this expensive device! Storing your paperbacks is no joke. Whether you stack them up, put them in boxes or just neatly arrange them on your study or shelf, they’re always occupying too much of your space! Plus with time, the dust, termites, etc get the best of your collection turning them into falling apart pieces of yellow stained papers. Where as e-books don’t require shelves or boxes to be stored in, and neither do they occupy a lot of your space! Plus, storing them isn’t much of an issue since they’re in digital format and are dust and termite proof! Well yes, the case of viruses and accidental deletion can lead to data loss, but then again you can back up your files. Imagine backing up your paperbacks by making copies of them or buying new copies. Doesn’t really seem that feasible right? How many books could you possibly carry, single handedly? In addition to this don’t forget to consider the distance to be traveled. 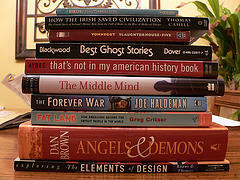 Carrying more than 5 books will turn you into a hunchback! There is a physical limitation to how many books can be carried around by one individual. Now think about how many books a child can carry or a senior citizen. With e-books, all you need is your device and the e-reader software installed in it, you can thus carry around a virtual library of your own! No back-breaking loads to lift and carry across distances, a one-stop digital device holds all your books in the digital format. Considering the compressed size of an e-book, a huge volume like say The Lord of the Rings Trilogy by Tolkien, can be stored on the e-reader at a size of approximately 10-15 MB. So depending on its memory capacity you can only imagine how many eBooks you can store on one device,. This is definitely much more than 5-6 paperbacks. Also any eBook device today is much more lighter and thinner than a paperback. So carrying your e-reader around allows you to read with ease while travelling and makes reading easier on your back too. When it comes to an e-book, the problem of being “out of print” or “no recent edition” is never a problem. Because once digitally created and stored on an e-book device, the book never goes out of print. An e-book can be read over a wide range of devices, like your laptop, a desktop, an e-reader and even on some mobile phones. True, there are many different digital formats and compatibility can be an issue. But the digital medium is very adjusting and converting between said formats can be done. e-book devices make reading in the most impossible situations like, in dim light or utter darkness, while walking or on the move, possible. Plus the font sizes and picture quality can be adjusted, so even with those with poor vision can read at ease. 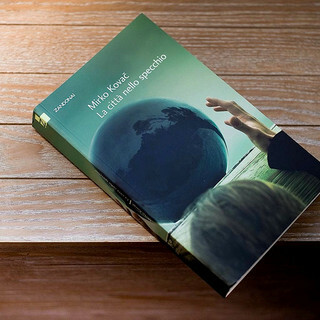 When it comes to reading in different languages, paperbacks can be very inconvenient because only the bestsellers are printed in different but not most languages. And here’s where an e-book trounces a paperback. E-books are available in multiple languages. Not just this, the e-reader offers a translation option, so incase you want to read the English translation of Voltaire‘s works or read the plays of Shakespeare in French, you don’t need to order a book or run around various bookstores searching for a translated copy, just go online and download the version you want. To get an e-book to read, all you have to do is go on-line, visit the on-line e-book store from your e-reader or search for e-books, purchase and download. Ready for your reading pleasure. You can peruse through multiple books or authors or search for a particular title. With books, you need to visit your local bookstore or shop, lending library, ask your friends and neighbors… more time is spent in searching for a book, than actually reading it. Plus on the Internet, there is an amazing array of books to choose from. Amazon alone offers nearly 950,000 e-books for the Kindle. An e-book is not made of paper or ink or plastic or any material except digital code. Hence no natural resources are spent in its creation, use or deletion. One paperback requires at least one tree for its production. Its production process also consumes raw materials. So for a smaller green footprint, reading an e-book seems to be the better choice. So does the future of books and libraries and stores that carry them really seem dim? 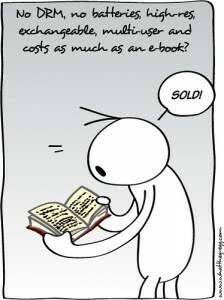 If the prices of purchasing an e-book and the price of e-readers increase, then books will continue to reign amongst the masses. 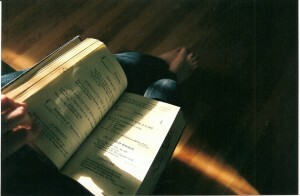 Traditional bookworms insist that the satisfaction from turning a page and holding a book in one’s hand cannot be replaced by a cold electronic device. On the other hand, keeping the example of cassettes in mind, an ever-increasing library of e-books could soon be the normal mode of reading. For now the debate rages on, only time will decide who the real winner is! We live in an age where technology and its advancements have helped make our lives so much more easier and simpler. Printing or getting your book published used to be such a hassle back in the old days. But now thanks to technology and the easy access to it by the general public, one does not need to go through the ordeals of the past. Technology has brought up a whole new breed of publishing; Self-Publishing. If you have a great idea for a book and good writing skills, you can have a book professionally published and made available to the general public. The process is called self-publishing and it’s an involved project. The following are the major steps involved with the self-publishing process. The type of book, your time and financial commitment, and the publishing process used will affect the order and time it takes for to you complete these main steps. Start by developing an idea, an idea that will run the main story line of your book. Remember just because you know English doesn’t mean you can write a story spanning 1000-40,000 words. You have to be creative and must have knowledge about the matters associated with your idea. Half knowledge about anything can be dangerous, thus research is a full proof method that always helps get proper information if conducted mindfully from reliable sources. Do a lot of research to make sure that your idea is viable on a full length book. Create a detailed outline for the book’s content. Get the manuscript proofread by professional proofreaders. It is next to impossible for us to proofread our own work because when we read we tend to read what we think we wrote, which makes it difficult to find our own mistakes. Thus it helps to have professionals proofread your work as they have trained in finding those common mistakes that we would otherwise overlook. If hiring a professional is not an option for you due to budgetary constraints, then you can ask some of your writer friends to have a look at your work. Hiring a professional maybe expensive but if you want your book to survive in the market out there amongst so many others then getting it proofread by a professional is totally worth the price. Seeking blurbs: A blurb is a short summary or promotional piece accompanying a creative work. You can get one from a well known author or a public figure who works in a literary field. You will have to request two or more authors to read your manuscript and provide their feed-back. It is these feed-backs that will make up the blurbs for your book. Choose a self-publishing option, such as offset printing or Print-On-Demand (POD), and then hire a printer and/or a publisher. Apply for an ISBN: An ISBN is the unique identifier for your book. It’s possible to buy one ISBN number, and even possible to obtain a free ISBN number. But unless you’ve only got one book in you, or you want to only publish through Amazon, it makes much more sense to buy your own ISBNs and to buy them in blocks. Your ISBN number holds the title of your book and the required information about your book. Obtain copyright and other book-specific information if necessary. (This step may be handled for you, depending on the publishing process you choose and the company you work with). Set the cover price for your book. Have the manuscript’s interior pages designed and laid out. Hire a graphic designer to create your book’s front and back covers. If you’re not a designer or artistically inclined, I recommend working with a designer to create your cover. No matter how many times you say it, ‘Never Judge a Book by its Cover’ that’s exactly what readers do while purchasing books. It’s also a good idea to study the sub-genre you’re writing in to make sure you’re creating a cover in the style that will signal to your potential readers that this is a book they’ll like. Designing the rear part of your book’s jacket is never easy. You have to a write a short description of your book, which is not so easy because you have to keep in mind the space available for the summary and the extra blurbs that you might sometimes receive. Remember the rear portion of your books jacket has to hold minimal valuable information about your book that will help the reader decide whether or not to buy your book. Minimal information because, while purchasing the reader will not have much time to go through a long description and will easily toss your book aside out of annoyance. This is why a short description helps. Believe me, this is the place where less is more. Develop press materials for your book. Develop a Web site to promote your book. This can be done by creating press kits. A Press Kit is a single page that has a description of the book, a small image of the book cover, selected blurbs and reviews, the author’s picture and biography, purchase details, and contact information. Begin pre-selling your book (pre-selling includes sending out press materials, promoting the book to distributors, lining up booksellers to sell the book, taking out ads, and so on). Have your book listed with online retailers. Publish the book and ship it to consumers, booksellers, retailers, and distributors (as appropriate). It may seem like a daunting task when you start, but taking all these steps will give you a much better chance of making yourself successful in the new world of self-publishing. There are tons of great writers out there who have made quite a lot of money by taking the self-publishing route, but it won’t happen to everybody! So set yourself up for success and it’s a lot more likely to come your way. Watching the book you’ve worked so hard on finally get printed is a whole different feeling by itself. It‘s not like the feeling that you get when you hold in your hands a recently purchased book. No, it’s like holding a new born, your first born! The feeling is incredibly satisfying. But getting this far was never easy for those who had gone about getting their book published the traditional way, and neither will it be easy for those who want to get their book self-published. The process of getting mere concepts and ideas in the print form may look like a painstaking process, but with the right help, from the right people, at the right time this complication can be taken care of strategically. To achieve the best possible results for your project, it’s often best to assemble a team of writing evaluators. You may be tempted to skip through the whole process of editing and proofreading, and so you use self-publishing as an easy ticket to fame. But even if you are an excellent writer, it is next to impossible to proofread your own work. This is basically because we tend to overlook our mistakes when we read our own work, as we tend to read what we think we wrote, which in the case of an experienced copy-editor these mistakes are hard to miss. Here is a list of the things Janice Campbell, Director of the National Association of Independent Writers and Editors says, you ought to do before jumping into the process self-publishing your book. First choose a good story from a range of interesting topics. This will include the main plot, the characters, etc. Remember, ‘Half knowledge is MORE dangerous than ignorance!’ So do a research to find possible resources who can give you proper and reliable information about the matter you want to write about. Research can also give you a brief idea of possible competitors. Plan your book, using a developmental editor or writing coach for structural help. Outline the text, chapter by chapter, backing up your files regularly to a flash drive. Draft each chapter using clear, vivid language. TIP: If you will be using a program such as InDesign or Quark to lay out the pages of the book, compose the text in a generic text editor such as TextEdit or TextPad. This will eliminate formatting-code problems in the page layout stage. Have your writing coach or developmental editor read through the completed manuscript draft and offer suggestions to enhance organization and clarity. Consider the coach or editor’s suggestions, and make changes to the manuscript. Repeat steps 7-9 until you have reached a satisfactory final draft. Turn over your final draft to a copy-editor for mark-up. Incorporate the copy-editor’s corrections into the document. Flow text into your page layout software (or turn the book over to a book designer). Print hard copies of the manuscript and have a proofreader go over the completed, laid-out text. Make corrections, and proofread again, both onscreen and on a hard copy of the draft. Generate the bibliography and Table of Contents. Have an index created by a professional indexer or use your page layout software to create an index on your own. Be aware that a professional indexer can probably do the job much more quickly and efficiently than you can, and a good quality index can be a valuable asset to your book. Put the completed book aside for at least a week, then proofread it again and make final corrections. Have a sharp-eyed layperson read through the entire book. It’s not likely, but they may spot an error that all the pros have overlooked! Send your completed manuscript to the printer of your choice. Now remember, writing a book and getting it published either way is hard work. There are no shortcuts. Self-publishing is not a solution, to the problems that writers have been facing with traditional publishing. You are bound to make mistakes that most authors do when they are in a hurry to get their book self-published. These are top five mistakes that Kristen Lamb says are killing self-publishing authors. When we are new, we often fail to understand what we do know and what we don’t know. Just because we know English, it doesn’t mean that we qualify to write a book spanning 60-100,000 words. There are countless writers out there, who refuse to read fiction, refuse to read craft books, but only go to pitch agents when they attend conferences at the expense of attending the craft sessions. Additionally, too many new writers do not properly understand the antagonist. They don’t grasp three-act structure which has been around since Aristotle, and there is a lot of evidence in neuroscience that suggests that the three-act structure is actually hard-wired into the human brain. Thus, when we deviate too far from three-act structure, it confuses and frustrates readers. Stories have clear beginnings, middles and ends. Without a clear story objective, it is impossible to generate dramatic tension, and what is left over is drama’s inbred cousin, melodrama. Yet, many writers start off writing a book without properly understanding the basic skeleton of the story. 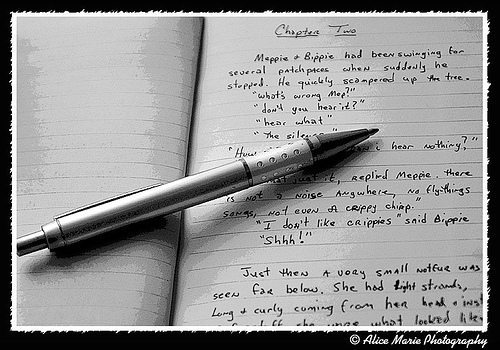 Writing fiction is therapeutic, but it isn’t therapy. Yes, characters should struggle with inner demons, but that does not make a plot. Struggling with weakness, inner demons, insecurity, addictions are all character arc, not plot arc. There should be a core story problem that we can articulate in ONE sentence. The plot arc should serve to drive the character arc. If the character does not grow and change she will fail, but it is the core story problem that drives this change. Without the problem, there is no crucible. The better we are at the basics, the better we know the rules, the more we become true artists. A lot of writers rush into self-publishing without properly preparing to be a small business, even though that is exactly what they are. When we self-publish, we take on new roles and we need to understand them. We need to be willing to fork out money for proper editing, cover design and formatting. One of the benefits to traditional publishing is they take on all the risk and do the editing, proofing, etc. When we go at it alone, we need to prepare for some expenses and do our research. We can be told a million times to not judge a book by its cover, yet that is exactly what readers do. Additionally, we may need to look into becoming an LLC. We need to set up proper accounting procedures and withhold the correct amount of taxes, unemployment, state taxes and on and on. There are a lot of writers who mistakenly believe that self-publishing is an easier and faster way to fame and success. Self-publishing is A LOT of work. Not only do we need to write good books, but we also need to write prolifically. We also need to work our tails off on social media. When we self-publish, we need a much larger platform because we don’t have New York in our corner. This is one of the reasons self-publishing isn’t for everyone. We need to look at how badly we want the dream, and then ask how many hours are we willing to work and what are we willing to sacrifice? There are a lot of problems with giving books away for FREE! We shouldn’t be giving away our work unless it serves some kind of a strategic advantage. There are ways to effectively harness the power of FREE! But too few writers understand how to do this and they just end up giving away their art for no tangible gain. This goes with the above point of us needing to understand the business side of our business. When we do choose to give away stuff for FREE! It needs to serve longer-term business goals. One of the BIGGEST problems with self-published writers is that they publish one book and then they focus every bit of energy on selling THAT ONE book. Self-publishing, in many ways, just allows us to accelerate the career path of the author. 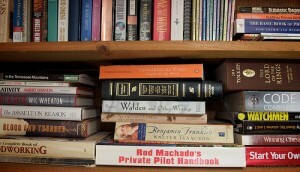 Even in traditional publishing, it usually takes about three books to gain traction. In traditional publishing, this takes three years because we are dealing with a publisher’s schedule. In self-publishing, we can make our own schedule, but it still takes THREE BOOKS AT LEAST. There may be exceptions, but most self-published successes hit at about book three. The ability to offer multiple titles is a huge part of why John Locke became successful. This is why it is critical to keep writing. Not only will writing more books make you a better writer, but once people discover they love your writing, they have a number of titles to purchase. Being able to offer multiple titles is how we make money at self-publishing. 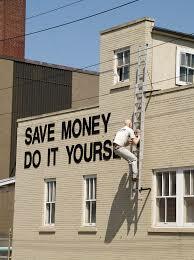 Self-publishing is a wonderful alternative. Just because we self-publish doesn’t mean we cannot publish other ways, too. Sometimes there are reasons we are being rejected and we need to take a hard look and be honest. Self-publishing is suffering a stigma from too many writers publishing before they are ready. The ability to self-publish is challenging all of us to come up higher. We are striving to be better writers, to be better entrepreneurs, to get better at organization and time-management and to write more books and better books. If we can learn from these mistakes and grow, then the future is ours for the taking. Considering that this statement was made with printed books in mind, will it still remain uncontested with the dawn of eBooks in the recent years? Comparing a book with an eBook is like comparing an analogue watch with a digital one, the latter being more sophisticated than the former. No one can doubt the convenience of the flexibility of the format that a reader gets in an eBook. But nevertheless they will never be able to successfully replace the experience of a printed book. But who says they need to? eBooks are a whole different figure and form by themselves as long as they do not attempt to imitate their printed cousins. We are still at the very early stages of eBook development. Like the early films and their visual effects, the boundaries in eBook development that will ultimately define its format have yet to be pushed. ‘The issue with eBooks as they exist now is the lack of innovation in the department of user experience. Like the first television shows that only played grainy recordings of theater shows, the eBook is a new medium that has yet to see any true innovation, and resorts to imitating an old medium. This is obvious in skeuomorphic (made to imitate) visual cues of eBook apps. Designers have tried incredibly hard to mimic the page-turns and sound effects of a real book, but these ersatz interactions satisfy a bibliophile as much as a picture of water satisfies a man in the desert,’ writes businessman Kane Hsieh in a piece for Gizmodo. There are always going to be eBooks that mimic a regular printed copy, like eBooks based on older works, or those that would like to do so because of market reasons. 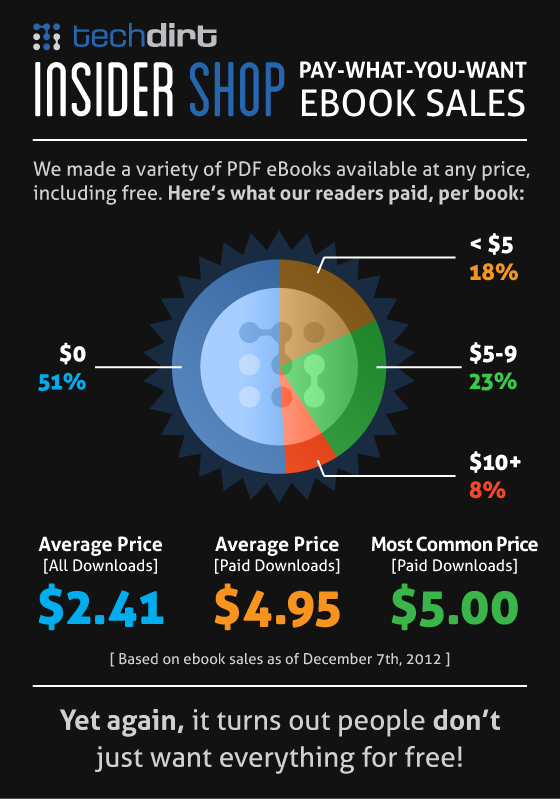 eBooks have more advantages than conventional books. We don’t read eBooks like we read a printed version. Printed editions have a monopoly on our attention. There exists only a one-way interaction between the reader and the book, that is from the book to the reader and not vice versa. So basically printed editions are static. On the other hand, there exists a two-way interaction between the user and an eBook. 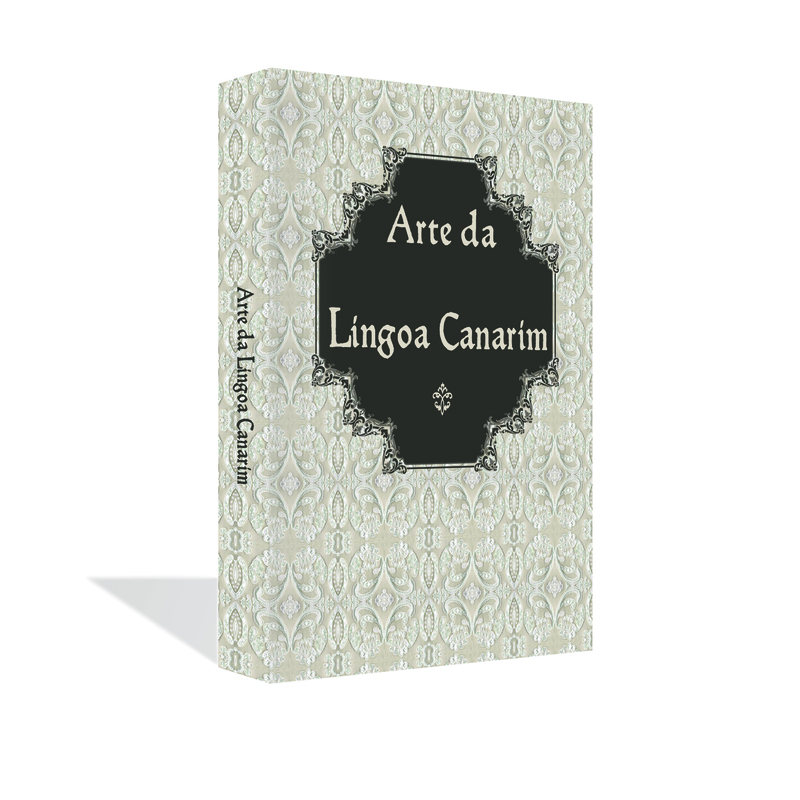 eBook software allow readers to translate texts into languages of their choice, a feature which was not covered by printed editions. Some e-Readers allow the user to read in low-light or even total darkness. 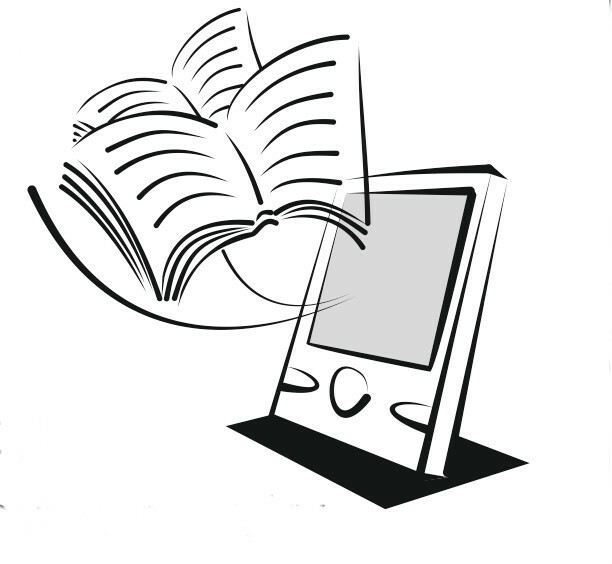 Many e-Readers have inbuilt software that help with easier interactions between the user and the device. The newer software can display motion, change the size or font of the text, and use text-to-speech software to read the text aloud for the visually impaired or dyslectic people and sometimes just for the user’s convenience. Software are also available that help search for key terms, definitions, allow highlighting, bookmarking and annotation. eBooks also gather a great deal of information about the user’s reading habits, like when he begins to read, when he stops, his pace while reading, when and what pages he skips, when and what he re-reads, what he chooses to highlight, what he chooses to read, etc. For a critic like Franco Moretti, the author of Graphs, Maps, Trees: Abstract Models for Literary History, this data is priceless. An eBook can be bought, downloaded and used immediately, as compared to the ordeal one goes through when one buys or borrows a book – the ordeal of going to a bookshop, or a public library during limited hours, or waiting for a delivery when purchased online or by other means. Besides, the production of e-books does not consume paper and ink. Printed books use 3 times more raw materials and 78 times more water to produce. Also, depending on the type of digital rights management (DRM) implementation, e-books can be backed up so as to recover them with ease in the case of loss or damage. And there may be possibilities of recovering a new copy without any cost from the distributor. 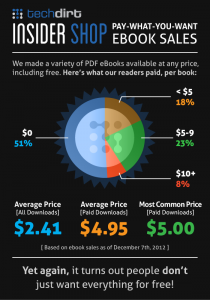 As compared to the traditional publishing methods, it is cheaper and easier for authors to self-publish eBooks. Sometimes the dispersal of a free eBook copy can also stimulate the sales of the printed version. 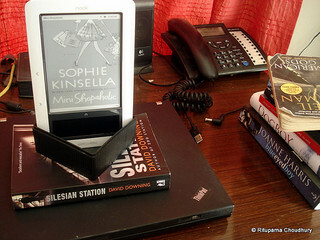 – the high cost of eReaders and similar devices has had an impact on eBook purchase. A mid category iPad will cost around INR 30,000 and a Kindle Fire would cost anything between INR 10,000-15,000. 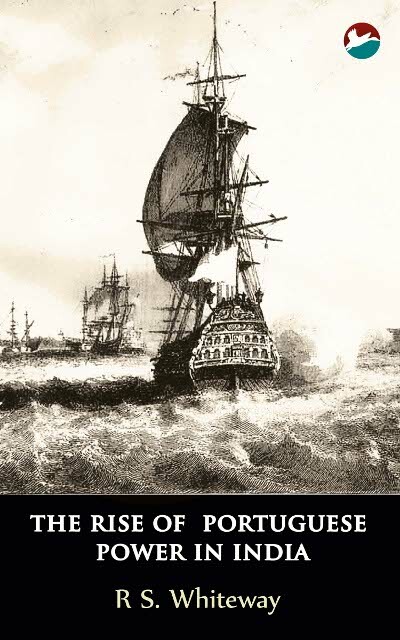 – Piracy remains a constant threat and readers often prefer downloading a book to purchasing one. 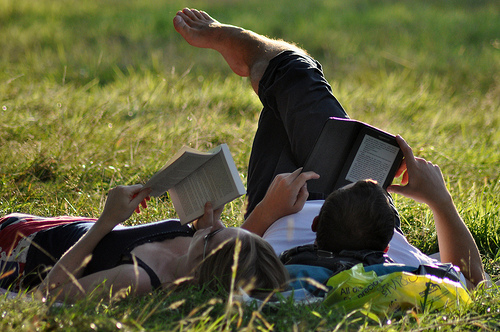 – Publishers haven’t jumped on the eBook development bandwagon yet. Those, like Penguin and Zubaan that are developing eBooks are doing so very cautiously. – A lot of material that is primarily in Indian languages cannot be rendered on eBooks. Devices meant for the sole purpose of making books in these languages accessible in the electronic format have failed. Australia and India have joined the UK and the US as world leaders in eBook adoption rates, according to Bowker Market Research’s Global eBook Monitor (GeM). Buyers in the UK and Australia target adult fiction as opposed to the professional books and academic textbooks that buyers concentrate on in India and South Korea. The report also reveals that the eBook market is set for a rapid increase in Brazil and India. Over 50% people from these two countries said that they were likely to buy an eBook in the next 6 months, which would double the number of eBook buyers in India, and triple the number of eBook buyers in Brazil. With the rise in adoption of large screen tablets and smart phones in India, Google has launched its eBook store(Play Books), through Play Store, in India. Though the smartphone market share in India is just around 15%, Google’s Android phone make up 56.4% of this number. This development can therefore catalyze the consumtion of eBoks because adoption of smartphones is growing by leaps and bound in the country. At the World Book Fair Delhi 2013, Rockstand, an eBook and e-Magazine application for mobiles and tablets unveiled their first regional eBook collection for its readers at the Book Fair. ‘This content alone will entice readers in various cities as well as readers who are on the look out for regional content like Hindi, Gujarati, Marathi. They will now have access to all these books on our platform. In total we are introducing regional content in 18 languages soon,’ says Praveen Rajpal, Founder, Director, RockASAP Retail Pvt. Ltd.
Publishers such as RockASAP have developed applications that are available free of cost and allow the book to be read on the user’s smart phone. Like other such devices, the application allows the user to change the font size or take notes. 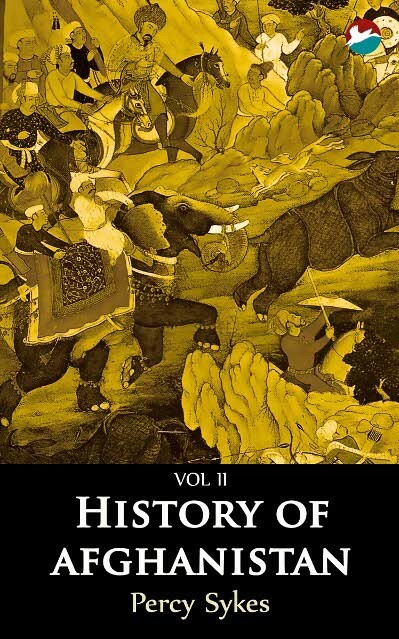 Similarly it has partnered with many publishers to make their books available for sale. There is hope that many other publishers offer such services. 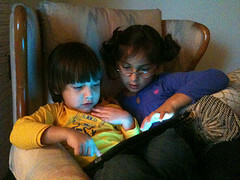 eBooks will become a different entity in themselves in the same way that board games became video games. In the beginning, they were merely the limited versions of the original, physical, editions. They later came to be more user-oriented. While some eBooks will choose to remain similar to the concepts of a regular printed edition, enhanced eBooks will take a form of its own, complete with every technological wizardry and component. 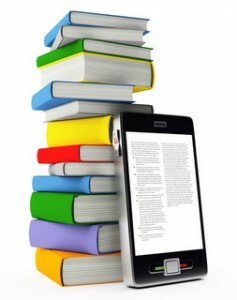 Over the years, there has been much debate on the appropriate format that eBooks should have. The eBook format a buyer of eBooks chooses will often depend on the reading device that buyer has, on whether he/she wishes to have the purchase synced to more than one device and the buyer’s preferred vendor of eBooks. From a publisher’s standpoint, however, the issue becomes much trickier. A publisher has to cater to more than one buyer and therefore cannot predict the reasons for a buyer’s purchase. The publisher has to therefore prepare for every eventuality and this can often lead to many costly iterations and time and budget overruns. In case of books that have some peculiarities, like images that cannot be allowed to flow as might be the case for a book of poetry, the fixed-layout format is often the most preferred format but its performance across multiple devices (eReaders) cannot be predicted. Similarly, certain fonts render perfectly on one eReader and won’t render accurately, sometimes won’t even show, on others. In the case of Indic fonts, this lapse is a significant one. eBooks can be read only on what are called eReaders or computers with software that allow eBooks to be displayed. Many such eReaders haven’t kept pace with advances in technology. Similarly, the technologies that are most often proposed for eBook development – EPUB and MOBI – don’t quite help eBooks realize the potential like other technologies do. Other technlogies like HTML, for example. HTML is the technology around which most websites are built. eBooks built on a pure HTML-based platform would, therefore, be able to do everything websites can do and can emulate the slick “look and feel” that many such websites possess. And because it is possible to view eBooks built on an HTML-based platform on the ever-faithful, ubiquitous web browser, the need for special software to view an eBook, whether on mobile devices or on your personal computer, is avoided. The pundits have all backed HTML as the technology that can truly deliver the potential of eBooks to reach out to readers and make reading a more interesting experience. Its power to integrate technologies such as audio and video seamlessly creates endless possibilities for the “book”. After our experiences with eBooks where recreating the same user experience across multiple platforms became an ever-enduring challenge, we decided to experiment with a pure-HTML eBook (with CSS and some Javscript). The result was this. We experimented with a simple eBook we downloaded from the Gutenberg portal. We coded it a little to make navigation easier and realised that with a little more time and effort, an amazingly responsive experience can be created – one that can incorporate various media should the book warrant such inclusion. For text-based books and books with a few images, it is definitely the right choice – both in terms of the effort involved and the consistency of the user experience across all eReaders. The benefit of not having to use specialised software to read the eBook is also a significant one that should not be easily dismissed. It is also easy to see why an eBook such as this, that is purely based on HTML, is shunned. It does not easily incorporate any restrictive measures, commonly called DRM. For those who wish to do that, this might not exactly be good news. But for the likes of us, who will trust buyers to do the right thing, this certainly seems the way to go.